The LHCb collaboration at CERN1 has seen, for the first time, the matter–antimatter asymmetry known as CP violation in a particle dubbed the D0 meson. The finding, presented at the annual Rencontres de Moriond conference and in a dedicated CERN seminar, is sure to make it into the textbooks of particle physics. To observe this CP asymmetry, the LHCb researchers used the full dataset delivered by the Large Hadron Collider (LHC) to the LHCb experiment between 2011 and 2018 to look for decays of the D0 meson and its antiparticle, the anti-D0, into either kaons or pions. The result has a statistical significance of 5.3 standard deviations, exceeding the threshold of 5 standard deviations used by particle physicists to claim a discovery. 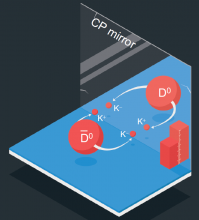 This measurement will stimulate renewed theoretical work to assess its impact on the CKM description of CP violation built into the Standard Model, and will open the window to the search for possible new sources of CP violation using charmed particles.